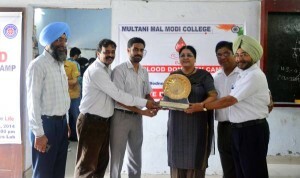 NSS Units of Multani Mal Modi College organized a Blood Donation Camp in which 69 units of blood were donated by the students as well as the teachers. College Principal Dr. Khushwinder Kumar and Dr. Kanchan Bhardwaj, Prof and Head, Department of Blood Transfusion, Govt. Rajindra Medical College and Hospital, Patiala inaugurated the camp. Dr. Khushvinder Kumar told that this act of blood donation is one of the most valuable services to the humanity which man can render. He further said that this is one of those blood donation camps which the college generally organizes on the request of Govt. Rajindra College and Hospital to meet special needs of their Blood Bank. College teachers Dr. Rajeev Sharma and Prof. Sumeet Kumar also donated blood. NSS programme officers – Dr. Rajeev Sharma, Prof. (Mrs.) Jagdeep Kaur and Prof. Harmohan Sharma worked tirelessly for the success of this camp.